The Tatra Mountains is the highest mountain range in the Carpathian Mountains. It is a natural border between Poland and Slovakia, with the majority of Tatras lying within the latter. Its natural habitat is protected by the establishment of the Tatra National Parks in both countries, which were jointly recognised by the UNESCO’s World Network of Biosphere Reserves. Most of Tatra Mountains landmarks are located within a few hours drive from Krakow. The largest and most vibrant mountain resort is Zakopane, just around 100 km distant from Krakow. Tatras provide superb conditions for hiking holiday and skiing adventure that will satisfy advanced mountaineers as well as leisure travelers. Characteristic of the Tatra Mountains are steep peaks, sharp rocks, crystal lakes and dramatic vistas. The Tatra Mountains are the most beautiful Polish mountains, each year drawing over 3 million visitors. The magnitude of Tatras and its pristine wilderness makes them more and more popular alternative to the Alps. Excellent weather conditions allow skiing from December till March and hiking between May and October. Although only one-fifth of the entire range of Tatras lies within Polish mountains, it comprises the most beautiful parts. The tourism industry is very well developed in Tatras and paths are always marked accordingly to the Central European Hiking Markers System. The highest peak of the Polish part of Tatra Mountains is Rysy (2499 m / 8198 ft). 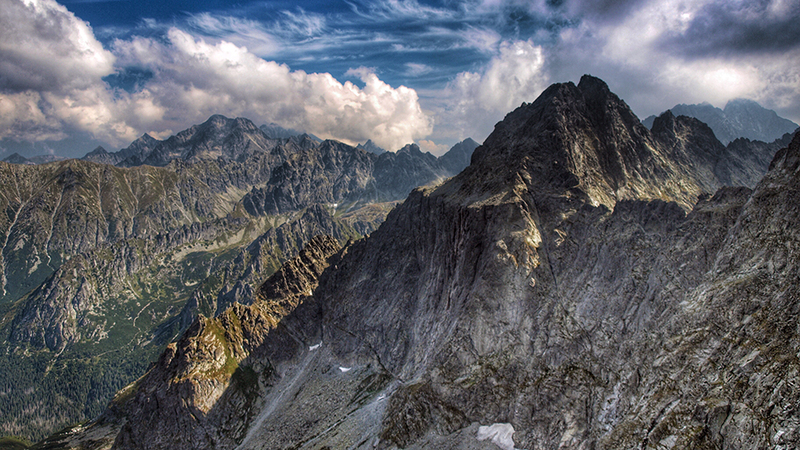 Rysy is among the most visited Tatra peaks. Its popularity is thanks to the incomparable panorama from its peak. In good weather, views in a radius of 100 km can be admired, so up to 80 other peaks of the Tatra Mountains can be distinguished, 13 major lakes and even Krakow, about 100 km distant. Climbing Rysy is generally not considered dangerous, however, preparation is required. The peak is divided in half, with one part lying on Polish side and the other, a little higher, on the Slovak side. The border between Poland and Slovakia can be crossed freely from 16 June to 31 October – because only in this period, trail on the Slovak side is open. The summit of Rysy can be ascended from the Morskie Oko lake. It is the largest tarn in the Tatra Mountains. It is undoubtedly the most popular destination in Tatras. It is easily accessible and a broad tourist infrastructure had been introduced around it. 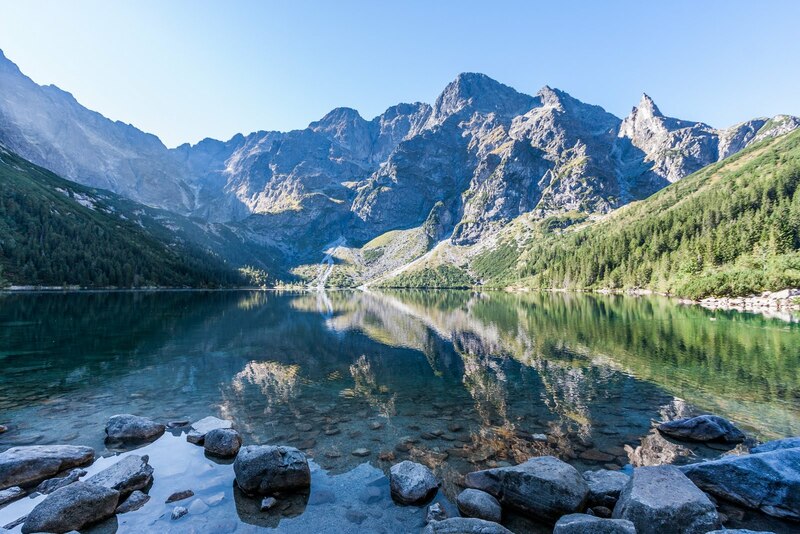 Morskie Oko is located in the breathtaking area, with the peak of Rysy overlooking the lake. Other peaks that surround Morskie Oko rise about 1000 metres above its surface. In the past, the lake was commonly called “Rybie Jezioro” (“Fish Lake”) due to its natural stock of fish, which are uncommon in Tatras. Located 188 metres above Morskie Oko is Czarny Staw lake. Conditions there are much harsher. The surface of the tarn for most of the time is almost entirely in the shadow, hence its name, Czarny Staw – Black Lake. One of the symbols of Tatra Mountains is Kasprowy Wierch. It is one of the most popular ski areas in Poland, thanks to almost always snowy slopes in winter and a beautiful vista. Kasprowy Wierch is easily accessible by aerial tramway that is one of the oldest in Europe, built between 1935 and 1936. 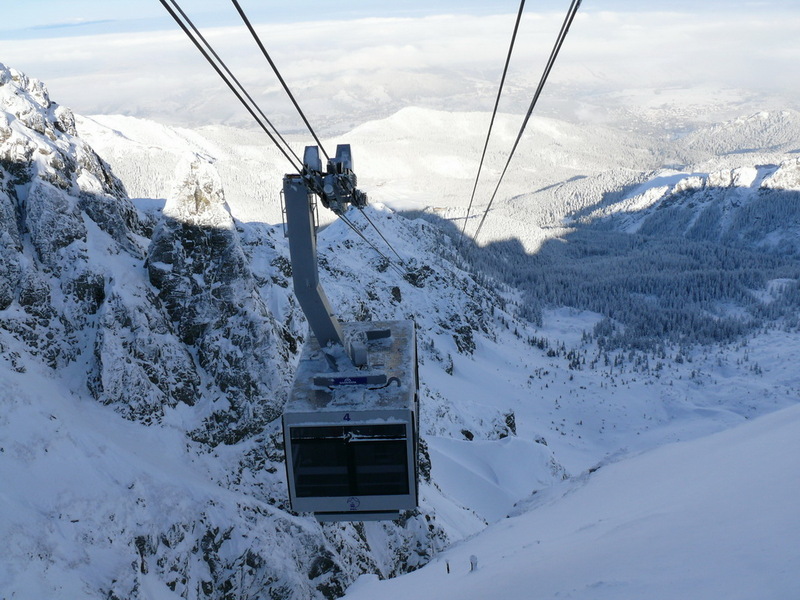 The aerial tramway reaches almost to the summit and is regularly used by tourists, that often wait up to three hours to use it. Three hours is roughly about the same time as it would take to ascend Kasprowy Wierch on foot. There are restaurants and information offices at the top and further ski lifts. Kasprowy Wierch can be also a convenient transition to other mountain paths and peaks. It is also another natural border between Poland and Slovakia that can be crossed without control. Beautiful and romantic are numerous Tatras’ valleys. All of them are perfect for long hiking and getting as much as possible from the mountainous landscape. The largest, Chocholowska Valley, is 10 km long and is among the most popular. This distance can be covered either on foot, by bike, trackless train or a horse-drawn carriage (in Polish bryczka), a very popular way of transport. 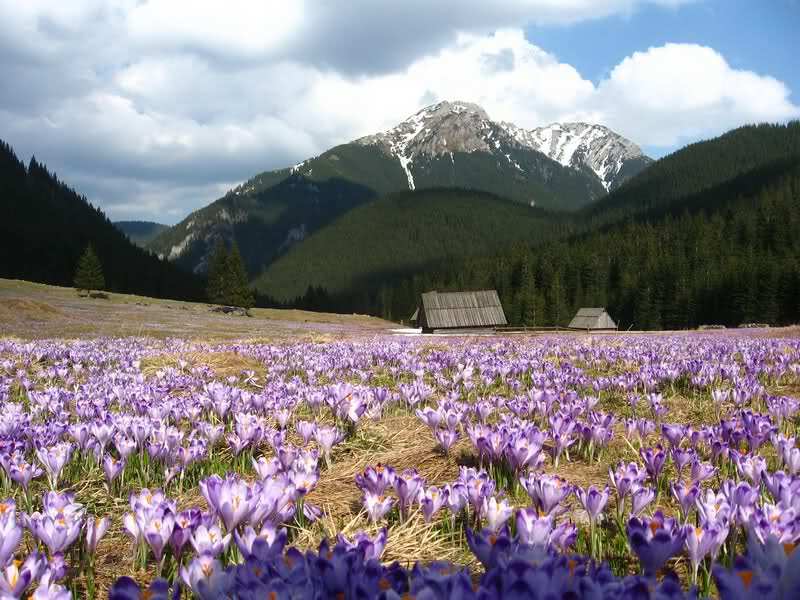 Chocholowska Valley is the perfect spot for early-spring admiring of blossoming crocuses. The second largest is Koscieliska Valley, 9 km long. It creates a long and deep rocky gorge, with walls so close to each other that they are called ‘gates’. Pieciu Stawow Polskich Valley (Valley of Five Polish Tarns) is another noteworthy valley in Tatras, because of its unusual location. The valley is located high above the tree line. Despite its name, it comprises of more than five tarns. The scenery of the valley is by far one of the most beautiful in the Tatra Mountains. The valley is also largely inhabited by wild animals such as bear, Tatra chamois, marmot, deer and lynx. 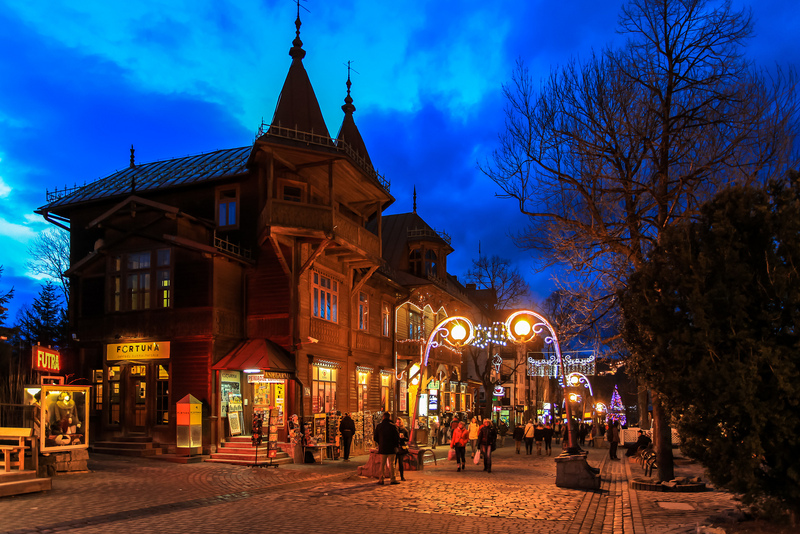 Zakopane is the ultimate Polish mountain resort. The city is located a little over 100 km from Krakow. Within close distance from Zakopane, a vast majority of Tatra Mountains landmarks can be found. Zakopane is the best destination to start hiking holiday in Poland. But, such popularity comes with a cost. The city draws millions of tourists each year and visitors looking for calmness and solitude may be overwhelmed with city’s hustle and bustle. However, since tourism is the main industry of the area, in numerous villages there are hotels and guesthouses offering lodgings for even better prices than in Zakopane. Moreover, the best mountain paths are within walking distance from almost every village or town in the area. Due to high altitude, the climate in the Tatra Mountains is rather cold. Weather conditions can change rapidly and sudden fierce rainstorms or thunderstorms are likely to occur. 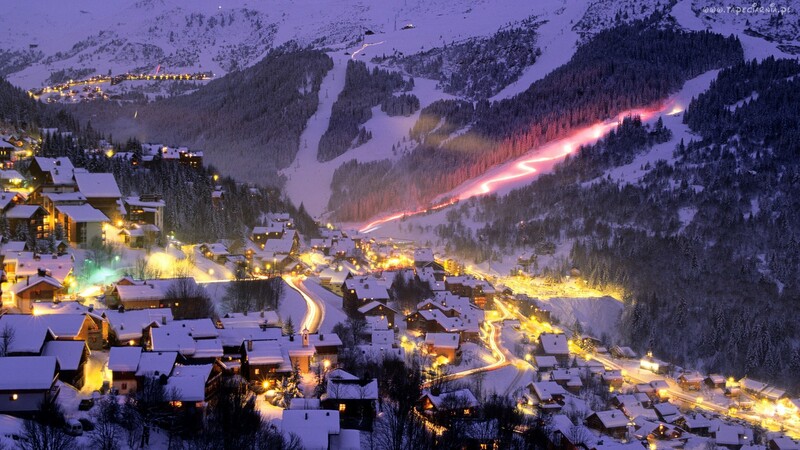 However, skiing conditions are often more than satisfying, with snow often up to a meter deep. During spring and summer months, temperatures are high and the weather is often sunny. The easiest way to reach the Tatra Mountains is to plan your stay in Zakopane. Tourist infrastructure is very well developed there and most of the landmarks are within close distance. You can reach Zakopane from Krakow by train or by bus that departs several times a day. A train departs from Krakow Glowny and it takes up to 4 hours to get to Zakopane. The bus ride from takes around 2.5 – 3 hours. There is also a possibility of ordering a private car transfer with a driver and door-to-door pick-up. Car drive takes around 3 hours. However, reaching other town or village within the Tatras area is not impossible. The most convenient way is to order a private transfer or rent a car in Krakow. There is also a vast network of local carriers that offer transfer to even the most remote villages in the area of Tatra Mountains.